At 9.19 p.m. on 8 November, the four LHC experiments recorded the first collisions of lead nuclei since 2015. For three and a half weeks, the LHC will collide these nuclei, comprising 208 protons and neutrons, at a centre-of-mass energy of 5.0 TeV per colliding nucleon pair. This will be the fourth run of this kind since the collider began operation. Lead ions have also been collided with protons in the LHC. Collisions of lead nuclei enable scientists to study specific phenomena, such as quark–gluon plasma. Previous runs with lead nuclei have already produced a vast amount of data on the properties of this substance. Evidence of many other phenomena, including light-by-light scattering, has also been found in these collisions. The LHC team intends to rise to various challenges during the 2018 run. 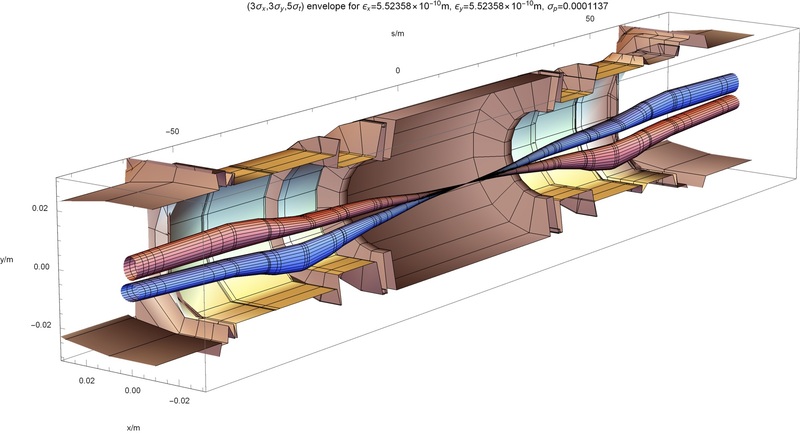 “We want to maximise the luminosity in order to generate as much data as possible and prepare for future runs, especially at the High-Luminosity LHC”, says John Jowett, the accelerator physicist in charge of the LHC heavy-ion runs. During the last run of this type, in 2015, the luminosity achieved was over three and a half times higher than the LHC’s design luminosity. “We are aiming for even higher luminosity this time”, says John Jowett. A new optics configuration has therefore been implemented and the magnets adjusted to reduce the β* parameter in the experiments (50 cm for ALICE, ATLAS and CMS and 1.5 metres for LHCb). This parameter is an indication of the focusing of the beam at the collision point: the smaller it is, the more compressed the beams and the greater the probability of interactions. The next step will be to reduce the time interval between the bunches of nuclei from 100 to 75 nanoseconds, thereby increasing the number of bunches circulating in the accelerator. The accelerator experts have been preparing for this run for several months. Numerous analyses and measurements have been carried out to improve the performance of the injectors (Linac3, LEIR, the PS and the SPS). Nevertheless, on Monday, 29 October, the lead ion source failed. The cause of the problem was discovered the next day: one of the five solenoid coils had stopped working. Physicists and technicians took apart the source to replace the defective coil; this complex work required all of the equipment to be dismantled and was carried out in only three days. On Friday, 2 November, the source was ready to be recommissioned. The first beam was sent to LEIR that Saturday and, the next day, lead ions reached the PS and then the SPS, before being extracted towards the transfer lines to the LHC. Despite this spectacular comeback, it took a few days to recondition the source and achieve the required beam properties (intensity and stability). In parallel, so as not to lose time, the accelerator physics specialists and operators used proton beams to set up the new LHC configuration. “Although we had planned these steps very carefully, we had to make some last-minute adjustments. We also adapted our strategy in the light of the ion source failure by making as much progress towards commissioning as possible using protons”, explains John Jowett. The first lead nuclei circulated in the LHC on Monday, 5 November. The radiofrequency acceleration system was adjusted to enable the beams to be intercepted: the particles injected into the ring are thus synchronised with the accelerating fields in order to keep the beam stable. The RF frequencies are then synchronised with the fields in the magnets to ensure that the beam remains on the correct path while being accelerated. The operators then produced beam loss maps, which are more complex than those produced for protons. With the new optics, collimators were set more tightly around the beams and delicate adjustments had to be found in order to protect the machine from losses in various locations. Test collisions were carried out on 6 November. After several days of intense preparations in order to achieve a high level of luminosity during the three and a half weeks of the run, the first stable beams for collisions were declared at 9.19 p.m. on Thursday, 8 November. The beam intensity and accumulated luminosity increased quickly, from 64 bunches per beam on the first day to 260 on the second day and 648 on Monday, 12 November. The beam size at the ALICE collision point is larger than it should be but measures to compensate this problem have been introduced while investigations continue. The lead-lead run will continue until 6 a.m. on 3 December, when the beams will be stopped. A week of LHC magnet training tests for operation at a future proton collision energy of 14 TeV is then planned. The second long shutdown will begin on 10 December.